It might be fun to raft some parts, especially UNA NP would be fun. Only have to go in the opposite direction than I did ;) . GPS for sure, also as long as there is no official Via Dinarica Green Trail in BiH it could be good to use other navigation apps like MAPS.ME and Wikiloc as well to find the most scenic hiking route. 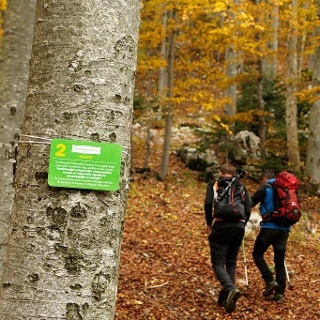 For detailed information about the Croatian section, have a look on the Via Dinarica HR page: http://viadinarica.hr/green-line/ Also keep an eye on https://trail.viadinarica.com/en/tours/ for new Via Dinarica Tours. We´ve been walking the tour in october 2018 from Postojna to Ogulin. Postojna was easy to reach by taking a bus from Lubijana. The ride was about 45 min and took us quite close to the trail. Day 1 – Postojna – bus stop -- Dom Rak - youth hostel (~20km): In general, an easy way, mostly through the forest. But without GPS it would have been hard to find in some points, because some of the ways didn´t seem to be used that often. At Dom Rak is some kind of national park, with a big cave and some natural bridges. The owner of the youth hostel allowed us to sleep in his garden. There was no possibility to buy food close by, but it was possible to eat and have a drink at the hotel next door. Day 2 - Dom Rak – Ževronica – Tekavca Ograda Farm (~25km): First part of the day, we´ve been walking further through the forest. After that we crossed some villages. At Cerknica (~15km) were two supermarkets. After Cernika we got a bit lost, because the GPS route guided us through a big field without clear pathways and partly ankle-high water. Later we figured out, that this field is a lake during late autumn and spring. So probably it would have been better to take this way in summer. But the landscape was quite nice and the stay at the Tekavara Ograda Farm at Ževronica very recommendable. We were able to sleep in the garden of the farm and to use the shower. The next morning, we got an amazingly big breakfast for 10 Eur. But one of the most important recognitions of the day, which followed us for the rest of the tour, were that the region still has a big population of bears. So it´s better to keep this in mind, when choosing your place to sleep at night, even if the risk is not too high. Day 3 – Ževronica – Bela Voda – garden camp (~30km): That day the trail was mostly through the forrest with some pitches. In the last village before Bela Voda was the possibility to buy some food and fill up some water. There is no public camping side in that area and also no good places for wild camping, but in Bela Voda were some people who gave us the possibility to sleep in their garden. Day 4 – Bela Voda – Horse Ranche (Kocev ka Reka) (~30km): Most of the day we´ve been walking along a street with fast cars, crossing some small villages without shops. The village which we reached at the end of the day had neither a place to sleep, nor a possibility to buy some food at the evening. There was just a small bar, with a guy who recommended us to sleep down the hill at the lake. There we found a roofed viewing platform, that was big enough for our tent, and a clean lake. The next morning we were also able to refill our food at the small village store. Day 5 – Kocev ka Reka – Fara (Vas) (~25km): That day we finally reached a real hiking trail again. A nice tour along a mountain top, nice views and a lot of pitches. In Fara (Vas) we were allowed to stay at the garden of a nice old guy and refill our water. Day 6 Fara (Vas) – Skrad (~15km): In the morning we crossed to border to Croatia. After a short way along a street we entered a national park with a waterfall. In Skrad we stayed at Mountain Lodge Skrad. In Skard were two stores and also the possibility to order some food from the Mountain Lodges owners restaurant. Day 7 – Skrad – Vrboskow (~30km): The first part of the day was on a nice hiking trail, the second part was along a street down to Vrboskow. On the way we crossed some stores. At Vrboskow we stayed at the described picknick biwak next to a restaurant. Day 8 – Vrboskow – Mount Klek (~27km): The way description away from Vrboskow was quite confusing. Following the GPS route we lost the direction several times. Some of the ways didn’t exist anymore. In the end we found an alternative way along a forrest street, without crossing any village the entire day. But the last kilometres up to Klek mountain hut were quite beautiful and also required some climbing. Unfortunately the hut was closed (end of season 1st of October) and no water to find. We had luck meeting someone who was there for some after season cleaning who switched on the water for us. The night we stayed at the mountain top. 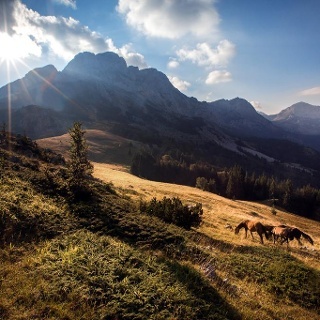 Day 9 – Mount Klek – Ogoulin (~12km): After an amazing sunrise we climbed down to Ogoulin. A nice trail down and a lot of infrastructure in Ogoulin. From Ogoulin we took the train to the coast.